Pork Was Made For Apples! The sweet tart flavor of apples were made for the rich taste of pork so we often cook a pork tenderloin as a fast supper. All you need is one saute pan to create this luxurious meat dish. Serve it with mashed potatoes and our Braised Red Cabbage for a German take on dinner. Pork Tenderloins come in all sizes but we choose one that will serve the two of us. If you are making this for a family, you can generally feel comfortable serving 1/2 a small loin per person. If you have a bunch of hungry husbands and sons to feed as we do when our sons and grandsons are here for dinner, let us suggest buying the larger tenderloins and serving 1/2 to each person. butter and olive oil for frying (we like to use both for better browning of the meat. 1/4 cup cold water or apple juice. 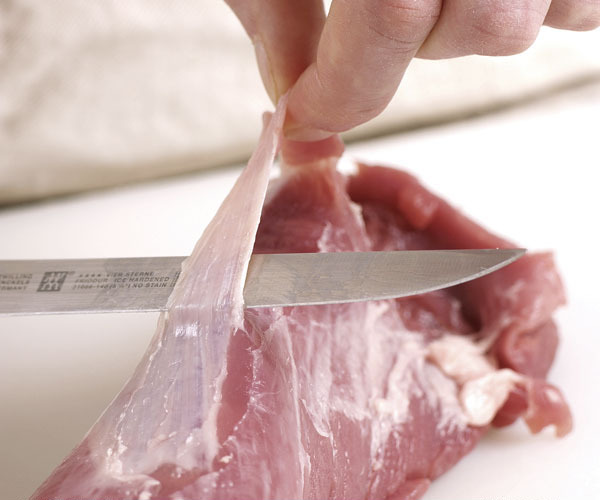 You need to remove the silver skin from pork tenderloin. Use a sharp knife to slide between the silver skin and the meat. Heat a large saute pan and when it’s hot, add the butter and oil. Once the butter is melted add the seasoned meat to brown on high heat. Once the meat has browned all over, turn the heat to medium and add the sliced apples to the pan. Add the water or apple juice. Toss in the fresh Thyme stems and cover the meat until the apples soften and the meat is tender. About 5-10 minutes depending on the size of the Pork Tenderloin. Do not over cook. You want the apples to keep their texture and the meat to have the slightest pink blush when sliced. Make it a perfect dinner with your favorite side dish. 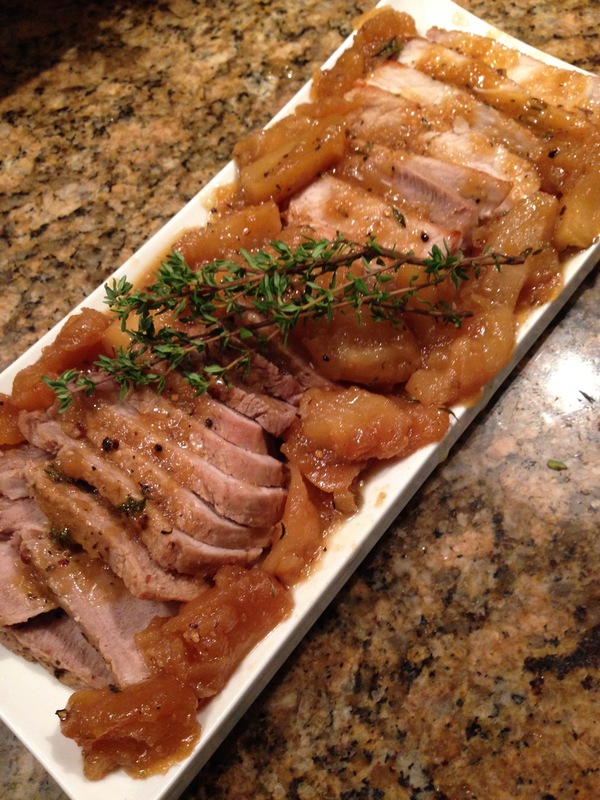 Serve the apples surrounding the Pork Tenderloin. This entry was posted in Dinner, Fast and easy, Meat, Winter and tagged apples with pork, fall pork recipes, pork and apples, Pork reipes, pork tenderlaoin recipes, pork tenderlaoin with stewed apples. Bookmark the permalink.